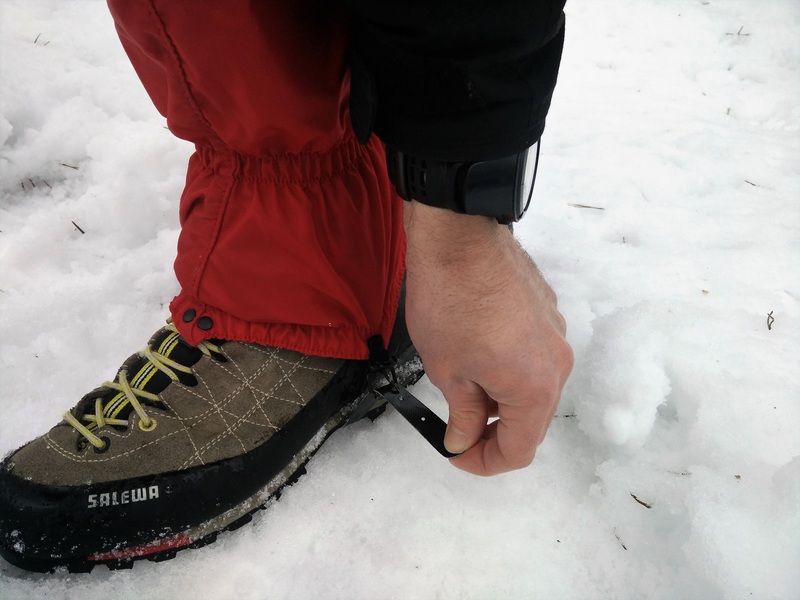 Home » Hiking Tips » Hiking Gear Guide » Winter Hiking Gear: How to use crampons, ice axes and gaiters? Winter hiking requires additional gear which keeps you going safe and steady on snowy or icy trails. 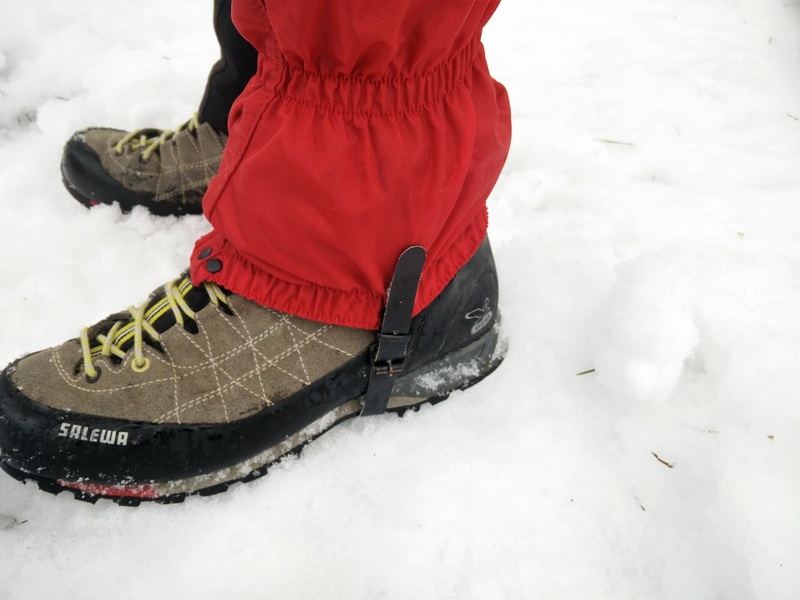 Gaiters, crampons and an ice axe are the three most often used items of winter hiking gear. 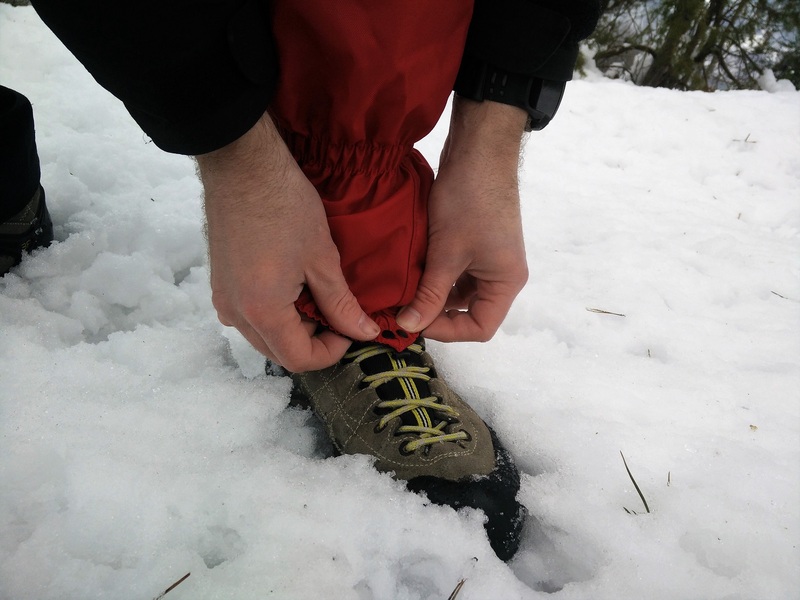 Gaiters prevent snow from entering your boots while crampons provide you with traction on icy surfaces. An ice axe allows you to arrest your fall in case you slip. 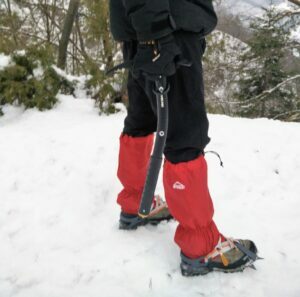 Gaiters are typically worn on all winter hiking trips while crampons and an ice axe are only used if the conditions require them (icy terrain). 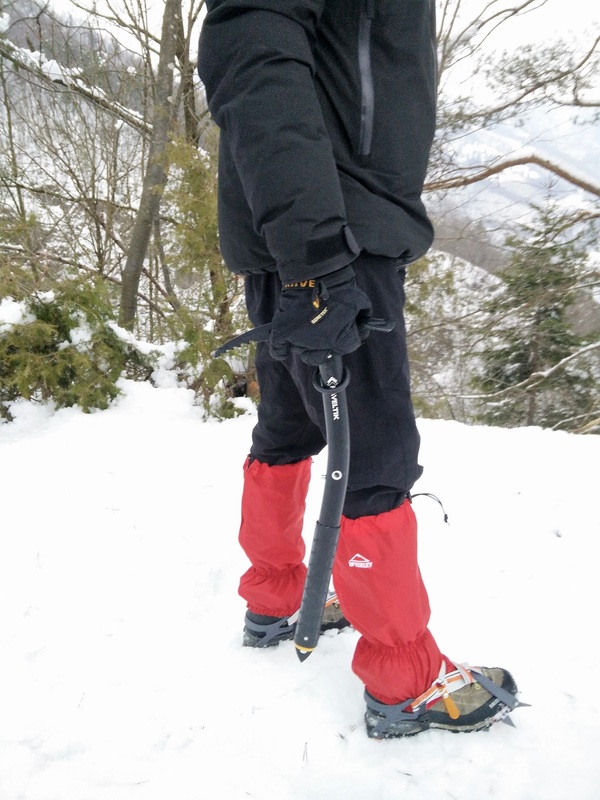 Many of those who are new to winter hiking don’t know how to put on gaiters or properly use crampons and an ice axe, and therefore we made this guide to winter hiking gear. We’ll explain when you need which item and how to properly use it. There will be also videos, images and links to other articles where you can find more information to complement the overview that this guide to winter hiking gear should provide. Gaiters are typically made of waterproof/breathable fabric and are worn over the top of your boots and covering the lower part of pant legs. Therefore, they prevent snow and dirt from entering your boots without decreasing breathability. 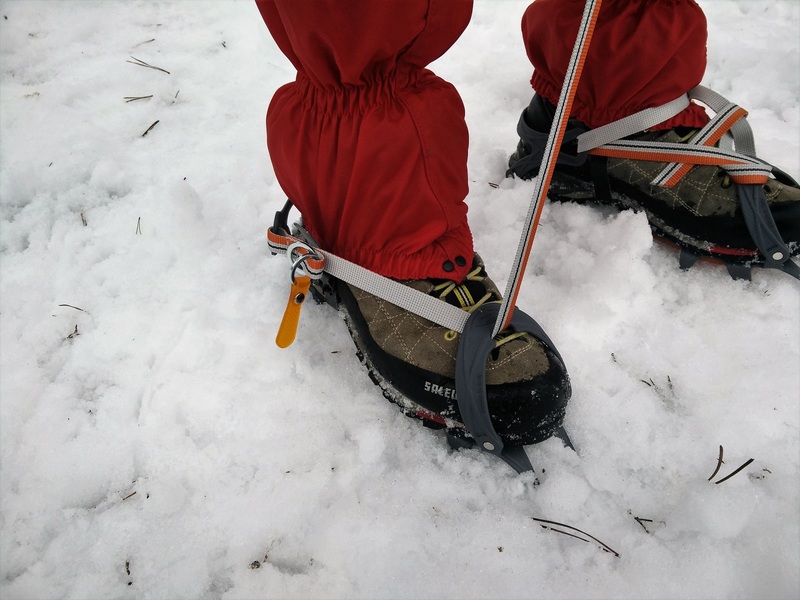 Gaiters typically have instep straps and lace hooks, so that they stay firmly attached to your boots. They are usually secured to your pant legs with a Velcro system (older and budget models have zippers instead) and a drawcord at the top. 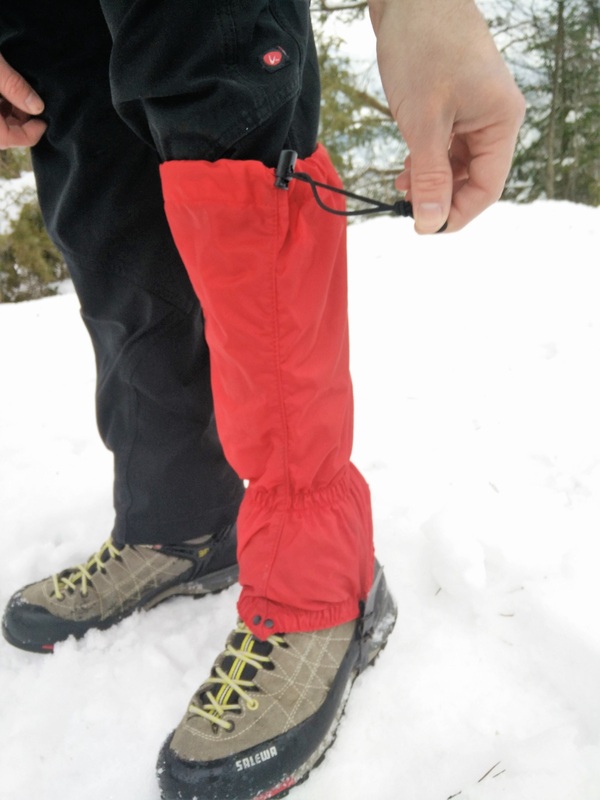 Gaiters are available in different lengths. 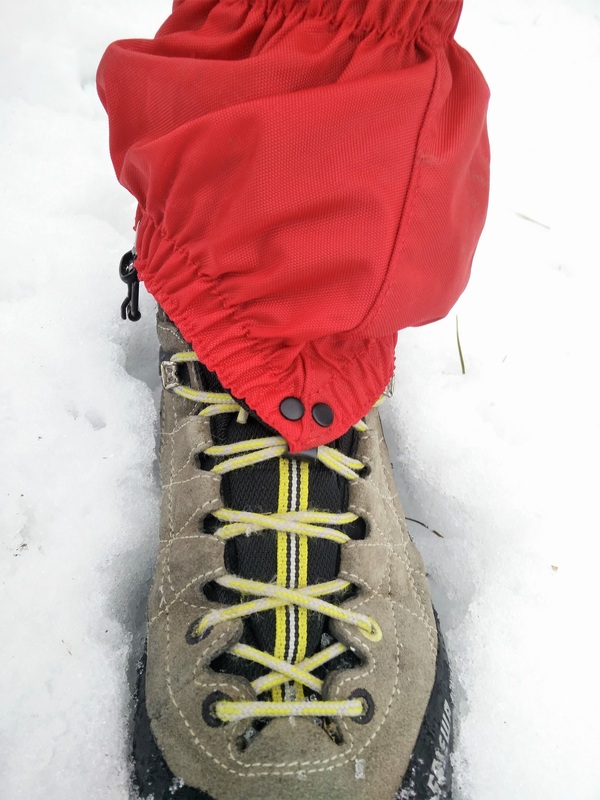 Hikers typically use knee-length gaiters as these offer the best versatility. 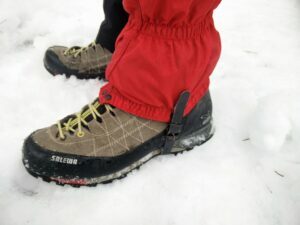 How to put on gaiters? 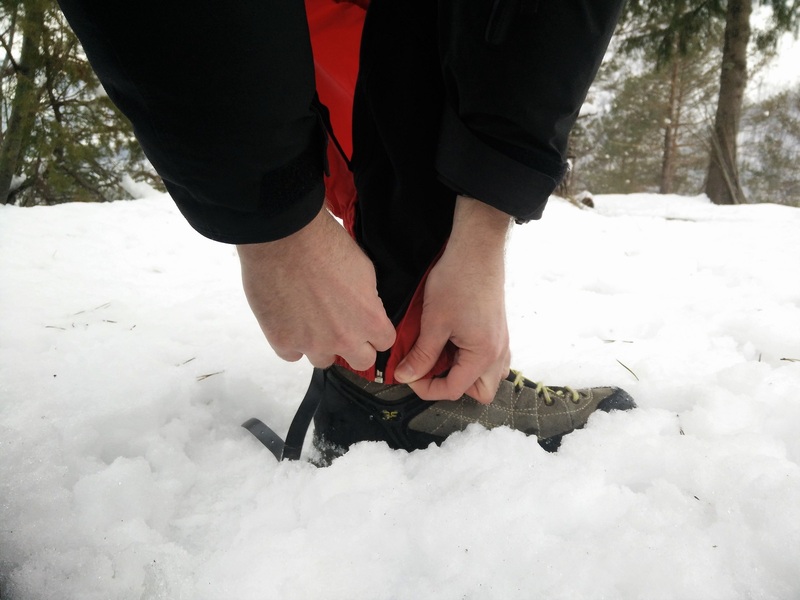 Find the lace hook and position the gaiter so that the lace hook is pointing towards the lacing on your boot. Video Guide – How to put on gaiters? Crampons are devices which are attached to boots to improve traction on snowy and icy terrain. 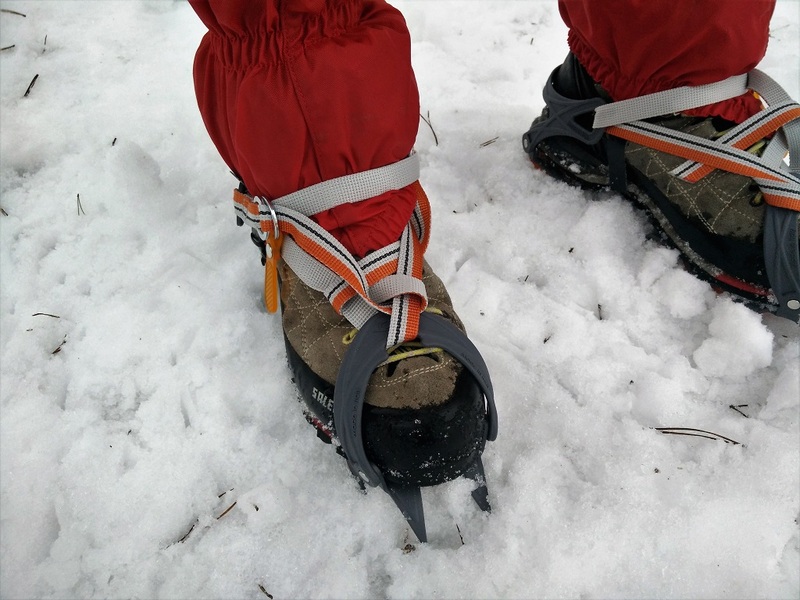 Crampons are made of steel or aluminium and have spikes which cut into the ice, thus ensuring good traction. 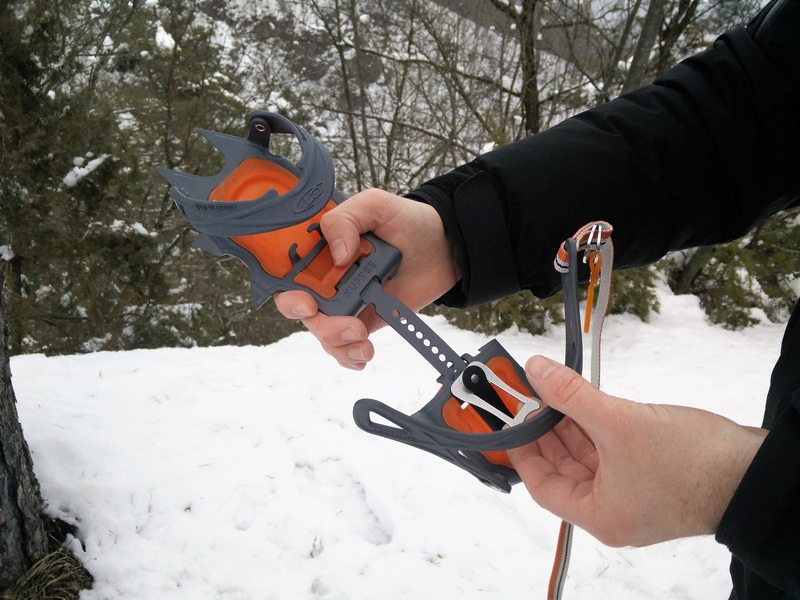 There are three different types of crampons (C1, C2 and C3) but here we’ll focus only on C1 crampons as these offer the best performance for hiking (C2 and C3 crampons are intended for ice climbing and mountaineering). 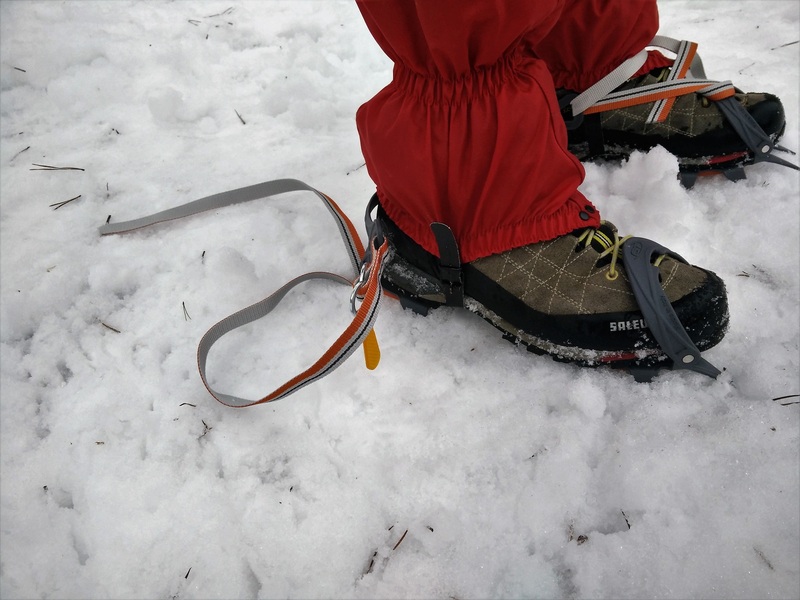 C1 crampons have strap-on bindings and therefore they can be used with any hiking boots. However, for the optimal fit it is recommended to wear boots with relatively stiff soles. 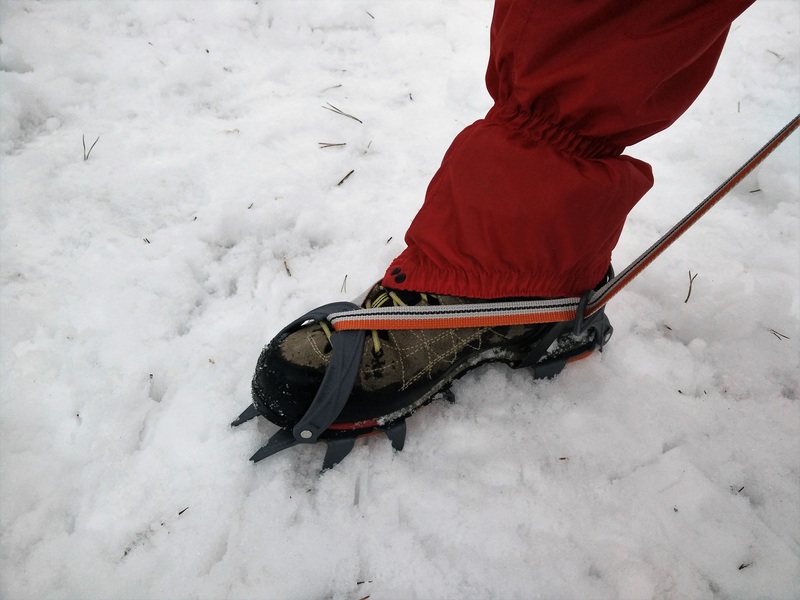 Note that crampons should only be worn on icy terrain and not on trails covered with soft and deep snow. For such conditions snowshoes are a better option. How to put on C1 crampons? 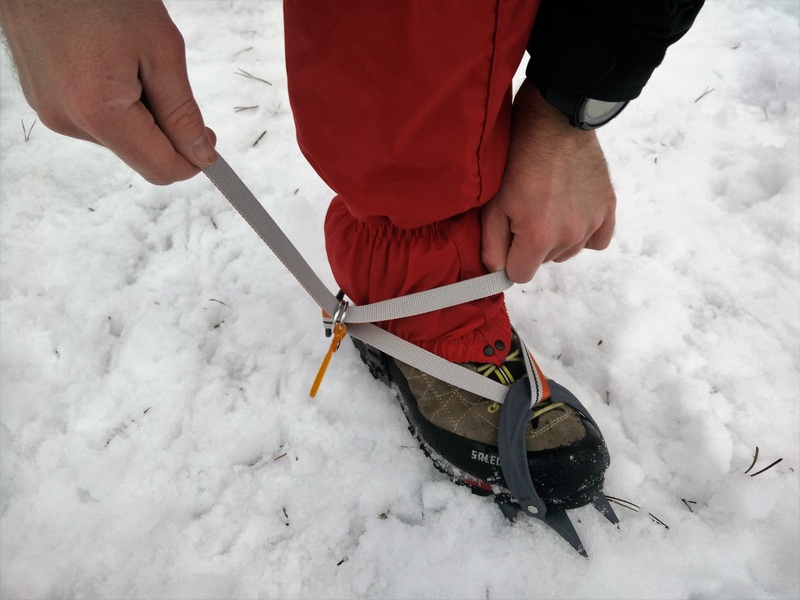 Note: Adjust the length of the crampon to the size for your boot already at home – pull the pin up and slide the center bar to the desired length (see images below). 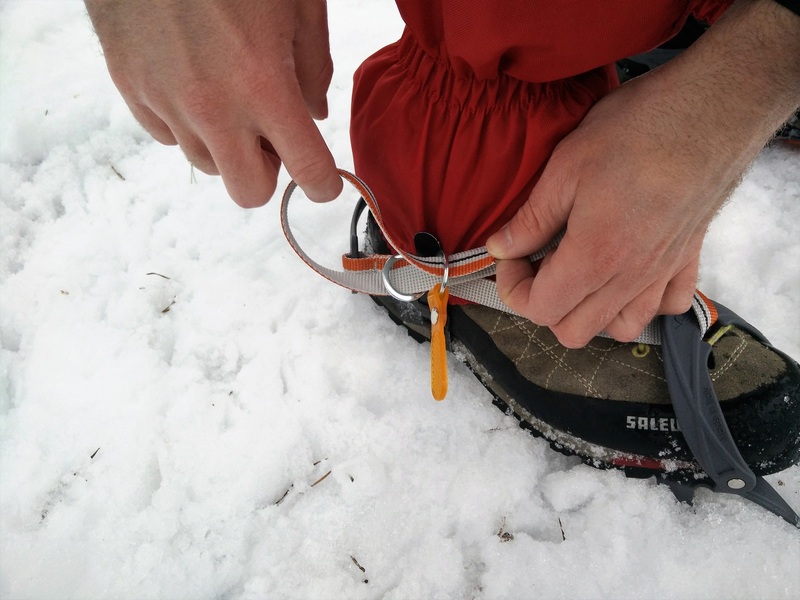 Video Guide – How to adjust the length of C1 crampons? Video Guide – How to put on crampons? What is an ice axe? An ice axe is a multi-purpose tool which among other things can be used for arresting a fall. 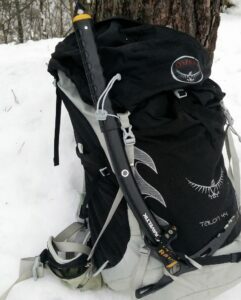 While hiking, an ice axe is held at the head (with the pick pointing to the rear) and used like a trekking pole. In case you should slip on icy surface, you lean on the pick and brake. A hiking ice axe consists of a shaft and the head. The head has a pick and a rear facing adze. Hiking and glacier travelling ice axes have long and straight shafts while climbing ice axes have convex shafts. 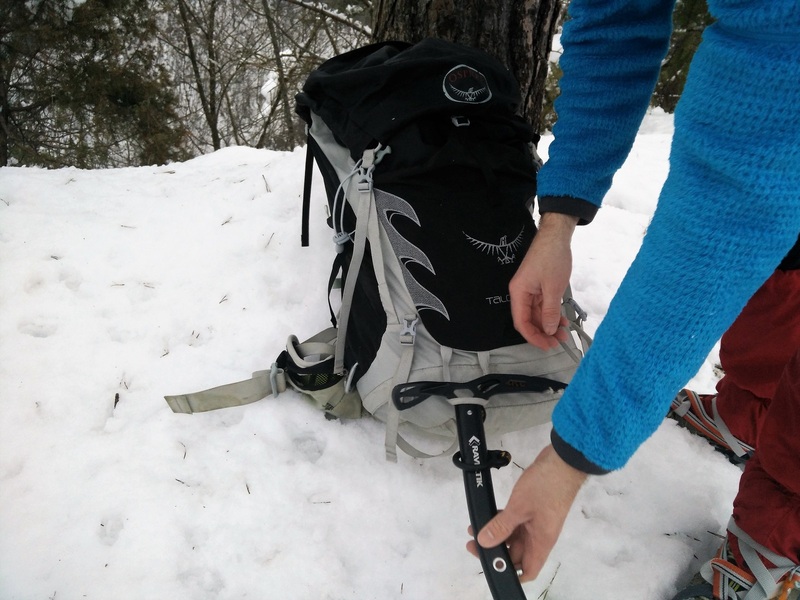 How to self-arrest with an ice axe? Note: Practice self-arrest on a not-too-steep slope before going on a hike – practice different positions! 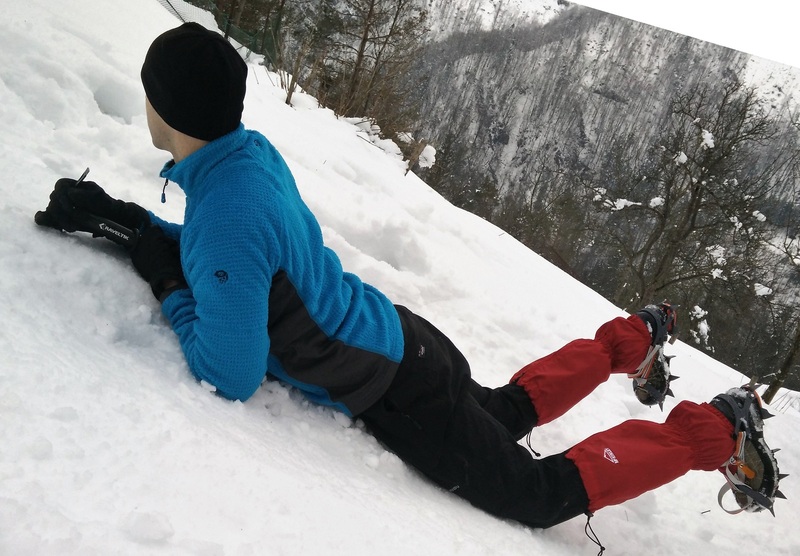 When you slip, roll yourself over on the stomach – your feet should be facing down the slope. You can use the ice axe to get into this position. Bring the ice axe to your chest with one hand on top of the ice axe and the other hand on the shaft. 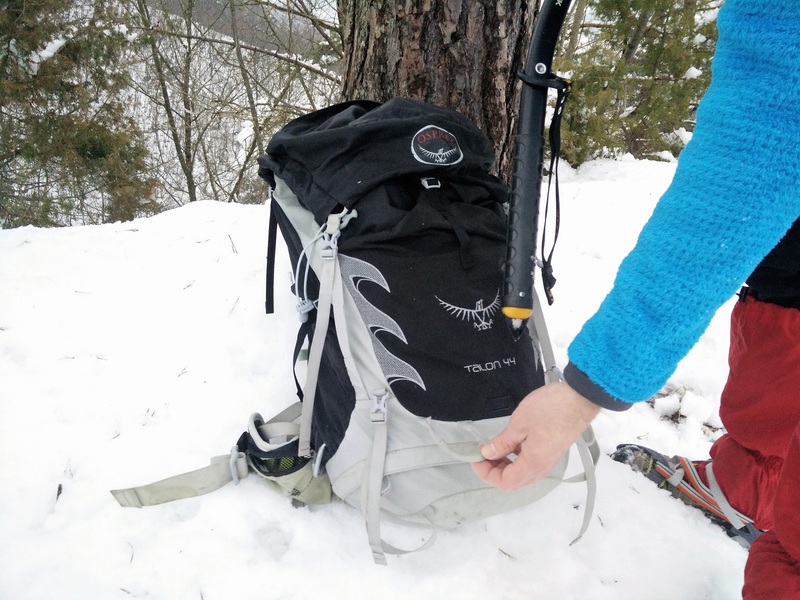 How to attach an ice axe to a backpack? 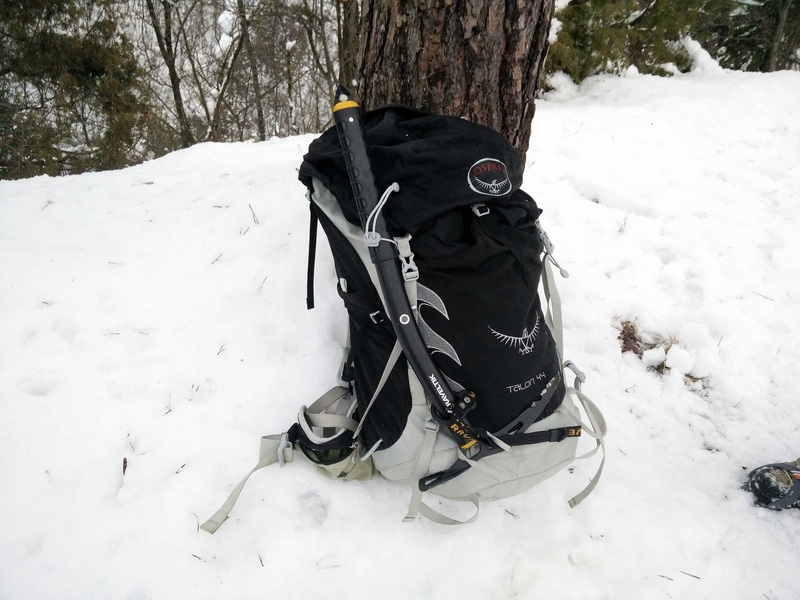 Because an ice axe is typically not required all the time during a hike, many quality backpacks have ice axe loops so you can store it away. This article is not a substitute for proper instruction or experience. 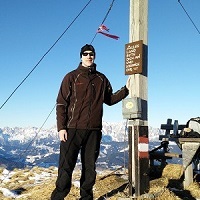 To learn more about winter hiking also check out our article Winter Hiking: 7 Essential Tips. Good spot Rob! 🙂 I fixed it. Thanks for letting me know.